Happy ducks are good egg layers! Ducks love it when they are not stressed and have a consistent schedule. 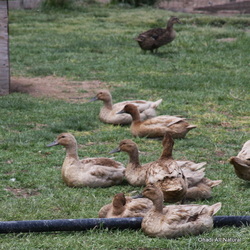 Ducks lay most of their eggs before 10 AM so are left in the duck barn common area until then. With sprinklers on early, the ground is moist and bugs are moving about. Whole grain feeders are placed near the water areas because ducks drink a lot of water as they graze. Ducks are good foragers. As they stroll about, snacking on bugs and grasses, they chatter to each other, moving in groups. In between, they nap in the sun.